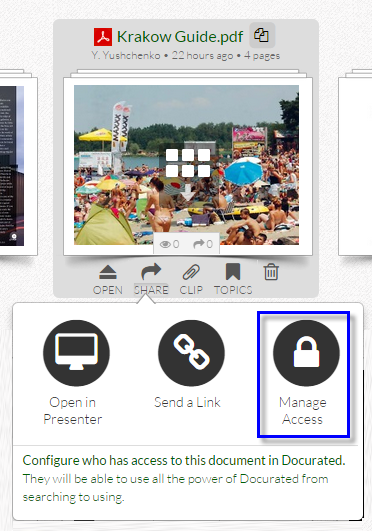 How to Manage Access to your documents in Docurated : Quark Software Inc.
At the bottom of a document, click the "Share" button. Manage access to everyone at your organization by selecting the Everyone at "Organization Name" option from the drop-down. Send notification emails to newly added users or teams (select the checkbox to send a notification email). Optionally, add a comment to the notification email. Remove added users and teams by clicking the X icon. Note: A file may include more users if it has been shared through a topic. Click the topic link to view the related files.